On Friday I attended the above seminar at Glasgow University. I’d never attended an event like this before. 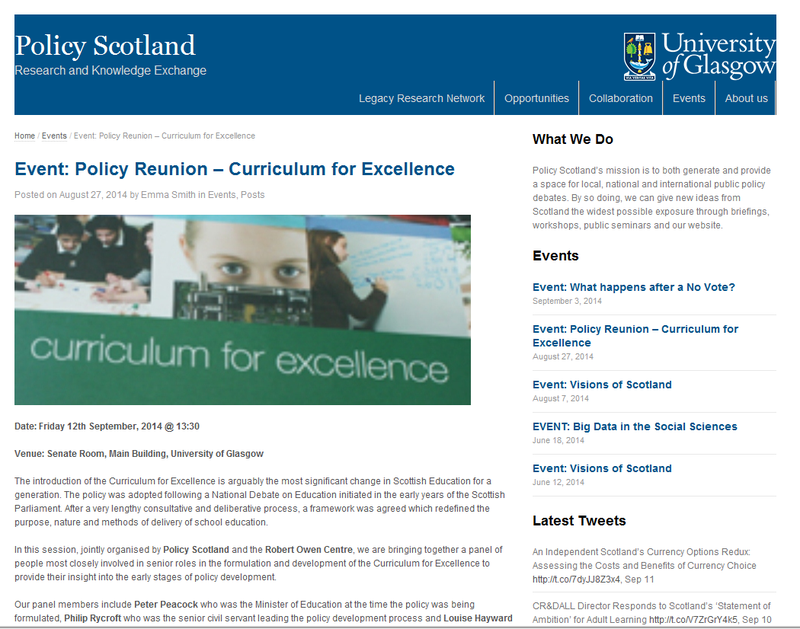 It was run by the Policy Scotland people who worked with the Robert Owen Centre, I believe, to put on this event. It was a free and open event, attended by education professionals, representatives from relevant agencies and members of the public. The panel of speakers were all key policy – makers at the early stages of CfE, including the then minister for education, Peter Peacock; the senior civil servant in charge of the policy, Philip Rycroft and professor Louise Hayward who was involved with the Assessment is for Learning programme which was developing at around the same time. George McBride, formerly of the EIS also made some recorded contributions, and chair of the event was Policy Scotland director, Des McNulty. It felt very unusual for several reasons. Firstly, the event took the form of a retropsective analysis by those involved of how the policy developed. This is not something we are used to in Scotland. Education policy tends to emerge from sources, usually government, or close to government or identified by government, then goes through implementation or perhaps acceptance (or some may even call it enforcement). The implementation processes of CfE have been expertly documented on this blog so I don’t wish to elaborate this now, but the unusual feature here is that rarely, if ever has a post-mortem on such a high-stakes policy been carried out in a public forum. Secondly, panel members spoke openly and frankly about the work they did at the time. Decisions that were made were questioned and honestly analysed, positively or negatively. The emphasis on the importance of achieving consensus was questioned; the lack of a critical voice anywhere in the early stages of the process was also questioned. Related to this, little or no theoretical knowledge about curriculum seemed to be represented in the original design group – Prof Hayward’s involvement was on a parallel, but different programme for assessment. The lack of evidence of progression, or of assessment as a feature of the new curriculum was also challenged – the two policies of AifL and CfE seem to articulate with each other more by accident than design. “Assessment was not addressed as clearly as it should have been.” The initial big ideas which were established were left underdeveloped intentionally, but the expectation that teachers would move effortlessly from a highly prescriptive linear curricular model (as was 5-14) to a much less structured, more open framework without the necessary space to develop their own thinking on this was misguided.As George MacBride said, they “underestimated the acculturation of teachers to prescriptive curricula.” More than once was it mentioned that things would be done differently in the benefit of hindsight, which is only human after all. It was good to hear acknowledgement of the shared responsibility for the success of CfE which extended beyond the teaching profession. Lastly I was struck by how arbitrary the organisation of government can be. In these early stages, two of the key individuals were removed from the process: Peter Peacock through health had to step down and Philip Rycroft was moved from his brief in this policy area. He had come from breweries before, but his time was up in education so he had to move on. Peter Peacock’s tenure in education would always have been subject to government prerogatives so he could have been moved at any time. The timing of these events undoubtedly had an impact on the process, however. For me it highlights how civil servants are there to serve the system of government above anything else. It may well be in the system’s interests to have agile servants who can slip into a different ministry with ease but I’m not sure if it is always in the interests of in this case, children in schools. A very interesting event. Will it help us push on with the evolution of CfE? I’m not sure but If mistakes are acknowledged and if barriers and blockers are identified, and if this can help us inform our approach to CfE then there might be a chance.The hitherto lack of clarity in this policy process has obscured many of the barriers and blockages – if we can’t see how power is circulating within this process then we can’t capture it, learn from it or build on it. This brief peek behind the policy curtain may or may not be a prelude to further discussion. If it is (who knows?) and the tone of the debate remains honest and doesn’t revert to defensiveness, then maybe we can be hopeful. This entry was posted in Policy and tagged analysis, curriculum for excellence, education, Robert Owen. Bookmark the permalink. “The two policies of AifL and CfE seem to articulate with each other more by accident than design”. An interesting point. My impression (as a reasonably well-connected observer at the time) was that the early team charged at LTS with implementing CfE actively eschewed the insights on curriculum reform learned from AifL. In particular, there seemed to be a rejection of the core methodology of the successful AifL pilot projects. So if I am correct in my recollections, this was no accident, but a lack of connection by design. 1. A set of core principles around which assessment for learning was developed. These were drawn from the seminal King’s College project run by Paul Black, Dylan Wiliam et al., and while they translated into a series of techniques, the principles remained visible in a way that has not always been the case with the subsequent adoption of what are widely known as ‘AifL techniques’. 2. A well-developed set of processes – a methodology for engaging teachers with the core ideas and techniques. This was especially geared at getting teachers to actively develop their own approaches from the principles (many of the AifL techniques had their genesis in this process). It is my firm view that CfE has suffered from a lack of attention of defining processes for engagement, especially in the early days when teachers should have been making sense of the big ideas in a more systematic manner. It is interesting to speculate on why there was so little dialogue between the AifL and CfE teams at this early stage – nevertheless, an opportunity seems to have been missed for whatever reason.